Summary of proposed tax changes from Trump and House GOP. Strategies to consider using to take advantage of the proposed changes. Which changes are most likely to occur. As we all know, on January 20th Trump will become the 45th President of the United States. He has made many promises during his campaign and one of the most ambitious, overhauling the tax code, will serve as the litmus test for his presidency. What we know is that there are many different ideas that have been presented by Trump, House Republicans and, to a lesser extent, Senate Republicans. The fun parlor game that we will play today is to try and predict what these changes will be and how they may impact your financial situation. Trump has promised to "drain the swamp" and to use his business expertise to get his changes implemented, but he now faces the reality of DC and must handle the expectations and wants of many different groups. The House Republicans are led by Paul Ryan and the Ways and Committee Chairman Kevin Brady, who is the top tax writer in the House. They have released a tax reform plan and have made this their primary focus now that they are back in session. The Senate GOP is being less talked about since they have not released a plan but are focused on a Bi-Partisan bill that could avoid a filibuster. Exercise stock options – Exercising NSOs (non-qualified stock options) will create a taxable event based on the bargain element (market price – exercise price). If you have 100 shares and the market price is $50 and the exercise price is $40, then the $10 difference per share is treated as taxable income. In this example, the person would have $1,000 reported as taxable income on their W-2. ISOs (incentive stock options) can create a taxable event if certain criteria are not met and the bargain element is treated as AMT income, but this may be of little concern since House GOP and Trump want to eliminate AMT. Maximize the power of Roth accounts – Contributions to Roth 401(k)s or Roth IRAs provide for tax-free growth and paying the income taxes now are less of a burden with lower tax rates. Roth accounts allow for tax-free growth for your money and are not subject to RMDs. Consider Roth conversions – By converting portions of your IRA into a Roth account you will pay the taxes now which will provide you tax-free growth going forward on that money and will also lower the impact of RMDs in the future. Business structure will be paramount – If you are a business owner, make sure that your business is properly structured to take advantage of these changes. Employees may be able to take advantage – It may be possible to restructure as an independent contractor that would allow you to take advantage of these provisions. Please be aware that you will give up employer benefits by making this change and it is something that must be discussed with a professional before making the change. Maximize capital asset purchases – If approved, Trump’s proposal is to no longer have capital expenses depreciated or amortized, but expensed instead. 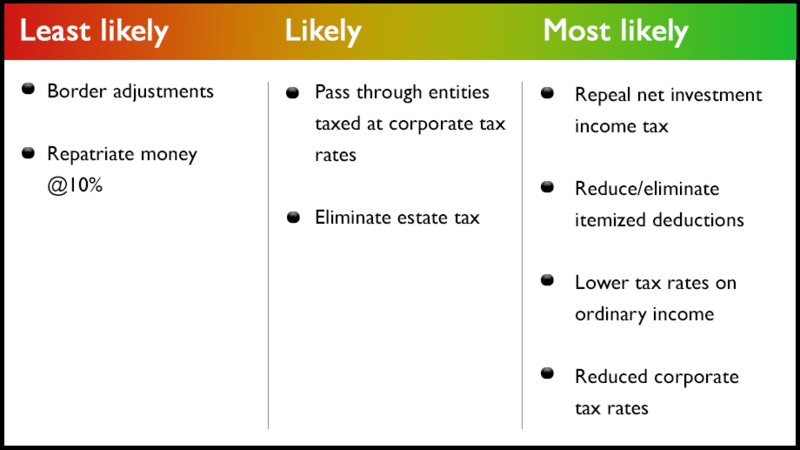 One of the most talked about changes has been the proposed elimination of estate taxes. While less than 1% of all estates pay the tax, it nonetheless provokes strong responses by both parties. There are more questions than answers at this point but below are some potential actions to consider depending on how it all shakes out. In a future article, I will discuss the ramifications of repealing the estate and/or gift tax. Wait and see – Sometimes the best action is no action. For those that are waiting to complete estate plans or already have plans in place, the best remedy may be to wait for the final decisions to be made and then act accordingly. Review current plans – Know what your current plan entails and work with a professional once we know what the final changes will be to gift and estate taxes. What changes are most likely to occur? What we know is that there will be major changes but there are many key items that remain uncertain. Will the House GOP or Trump be able to implement all the changes they want? Also, standing in their way are Democrats in the Senate who can Filibuster any changes, which would force the changes to be passed under a Budget Reconciliation process. This would make any changes temporary and would limit any potential long-term impact. Special interest groups and powerful lobbyists will also oppose many of these proposed changes. If Trump and the House continue to push through their plans, they increase the chance that the changes are temporary. The Senate are trying to make a bi-partisan deal to make the changes more permanent. While concessions would need to be made, this would help from a planning standpoint to make changes more concrete. Unfortunately, the best we can do is continue to be well informed and wait, but there is merit in understanding the potential impacts of any changes to make sure you position yourself in the best possible manner.